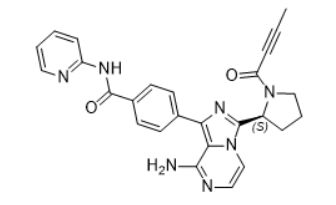 Acalabrutinib, also known as ACP-196, is an orally available inhibitor of Bruton’s tyrosine kinase (BTK) with potential antineoplastic activity. Upon administration, ACP-196 inhibits the activity of BTK and prevents the activation of the B-cell antigen receptor (BCR) signaling pathway. This prevents both B-cell activation and BTK-mediated activation of downstream survival pathways. This leads to an inhibition of the growth of malignant B cells that overexpress BTK. BTK, a member of the src-related BTK/Tec family of cytoplasmic tyrosine kinases, is overexpressed in B-cell malignancies; it plays an important role in B lymphocyte development, activation, signaling, proliferation and survival. 0 - 4 ℃ for short term (days to weeks), or -20 ℃ for long term (months).